One needs an deep understanding of how different types of processors work and how memory protection is implemented. Understanding how the target Operating System, in this case Windows 10, protects memory will be crucial later in the process of rootkit development. As this research continues, I expect this transform from "Writing a Windows 10 rootkit" to "1001 Ways not to write a Windows 10 rootkit". However, if everyone knew what they were doing, this would no longer be research. The main approach that is currently being taken is comparing the ways in which the Windows 10 kernel/OS handles processes than Windows Vista, Windows 7, or Windows 8 does. Windows Vista is included due to the fact that the "defacto" book by Blunded 1 on rootkit development is written around Windows Vista. There is an updated version of this book which may be purchased at a later date. While a deep understanding of how memory is accessed through the processor is needed, this short paper will provide a high level overview of this process, the memory protection that has been used by other Windows Operating Systems, and the tools and setup that I will use to begin examining the Windows 10 Kernel. Each process that is run has its own space in RAM. Additionally, each process that is running has different levels of access to memory. These levels can be thought of as a type of permissions. There are 4 different levels of permissions, each referred to as Ring 0, Ring 1, Ring 2, and Ring 3. A process running in ring 0 has the highest level permissions. The process running in ring 0 are often running at the kernel level. The kernel is the layer that is between the operating system and the hardware that the operating system uses such as a keyboard, mouse, speakers, etc. In order to be able do this, drivers are often installed to assist in this process. While most of this does not have a lot to do with a user-mode rootkit, a kernel level rootkit can leverage the installation of these drivers to install itself at the kernel level. This can effectively run the rootkit in ring 0, giving it the highest level of permissions. This research will focus on Intel 32 bit processors. The difference between 32-bit and 64-bit processors is the amount of memory that each can access. 32 bit processes can access 4 GB of memory, 64-bit can access much more than this. However, there are some extensions that can enable a 32 bit process to deal with more memory. Physical Address Extension ( PAE) for example will allow a 4 extra bits to be able to be used by the processor. So 2^36, a 32 bit processor can now utilize 64 GB of memory vs. the old 4 GB of memory. to the debugger will spill out and decode the segmentation descriptors that correspond to the segmentation selector fed to the command. In this case the command return the following. Looking at the 5th column provides the level of privilege that each segment descriptor defines. In this case they are all running at ring 3 or ring 0. This can be thought of as a two-ring memory model instead of a 4 ring memory model. The above output does not implement segmentation. This can be seen because segments 2-5 span the same address space. This provides us with an overview of what the memory protection in Windows 10 looks like. This type of protection is the same as previous versions of windows. There is no surprise here. I have one host machine running Ubuntu 14.04. This machine is running two virtual machines (VMs) on a VirtualBox hypervisor. The first one is running Windows 10 32 bit English and the second is running Windows 7 32 bit with Windows 10 debugging tools installed. This setup may change as the project progresses. 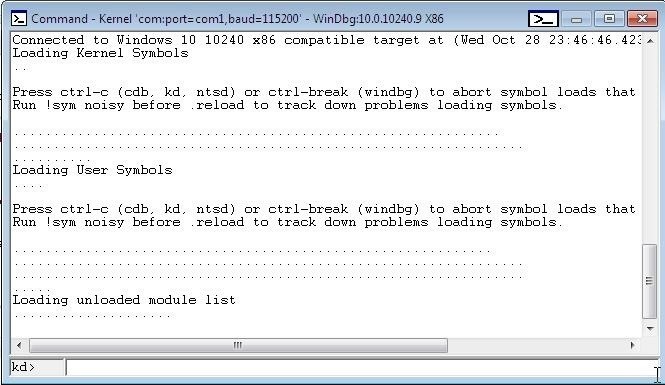 These are by default installed in "C:\Symbols", this path will become important later. Now VirtualBox must be configured to allow these two machine to communicate over a serial port. 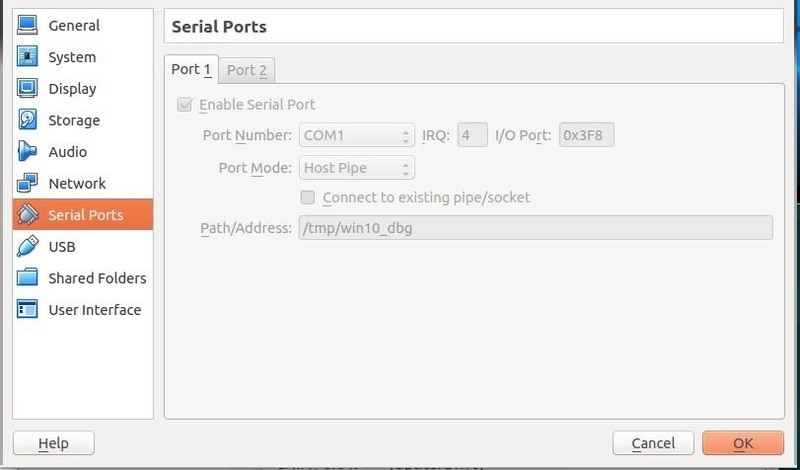 This can be done by going to settings>serial>enable serial port. Then giving a path, for example "/tmp/debugport". On the Windows 7 machine, uncheck the "Connect to existing pipe" box; however leave this box checked on the Windows 10 VM Figure 1. Then boot up the Windows 7 VM. Now we can run debugging commands to see the processes running, view what is stored in the registers, and more! This will help with understanding the Windows 10 kernel. 1 Bill, Blunden. "The Rootkit Arsenal. Escape and Evasion in the Dark Corners of the System." (2009). Hey looks pretty sweet, I'm looking forward to this! Great article! can't wait for part 2! Great article! Looking forward to more parts in the series! I wish I could decipher this tutorial lol. I tried learning ASM. It went horribly bad lol. Very nice really picking up on this..
We are at highest level here.